With the proximity of exciting attractions, activities, accommodations, and shopping and dining in Branson, this makes Lake Taneycomo one of the most popular of the Ozarks lakes. This beautiful lake in Branson offers visitors year-round outdoor recreational opportunities, from fishing and boating to sightseeing. Many of Branson locals and visitors alike know that the most popular way to experience a great fun activity on Lake Taneycomo is a sightseeing cruise with delicious meal. Lake Taneycomo is one of the most popular lakes in the USA with crystal clear waters that provide water sports enthusiasts a perfect combination of fishing and boating adventure. The rainbow trout and brown trout in Lake Taneycomo provide fishing enthusiasts enjoyable fishing experience all year long. The Trophy Trout Area offers anglers bait fishing that can give them a rewarding experience for coveted Brown and Rainbow Trout fishing state records. The coldwater of Lake Taneycomo comes from Table Rock Lake. Its cold clear water has an annual stock of approximately 750,000 (ten to twelve inches) of rainbow and brown trout that makes the lake a favorite fishing destination. The downstream area to Powersite Dam and Forsyth which is the lower portion of Lake Taneycomo has warmer water with many different kinds of species, making the lake the most challenging fishing area for anglers. The Lake features full service marinas, area resorts, campgrounds & RV parks that offer kayaking, canoeing, boating, experienced guides, and pontoon boats for a relaxing and fun-packed water sports adventures. At the uppermost portion of the lake, there is a reserved area where anglers can fish using artificial baits. In the historic downtown Branson near the lakefront of Taneycomo is where the Branson Landing is located that offers great shopping experience and fine dining in Branson. Branson Landing features hundreds of retail outlets, souvenir shops, restaurants, and the spectacular fountain. Branson Landing Cruises on Lake Taneycomo offer visitors two different cruising experiences, the Landing Princess and the Lake Queen. The Landing Princess is a luxurious 100-foot yacht that offers two climate-controlled decks and a grand outdoor deck, making it the perfect choice for intimate couples who want to experience a memorable cruise on Lake Taneycomo in any season. Landing Princess offers a variety of cruises on the lake. The Sightseeing Cruise is the perfect way to relax and enjoy the picturesque sceneries around the lake, Mount Branson, the Lake Taneycomo Bridge, and the Branson Landing Fountain Show. 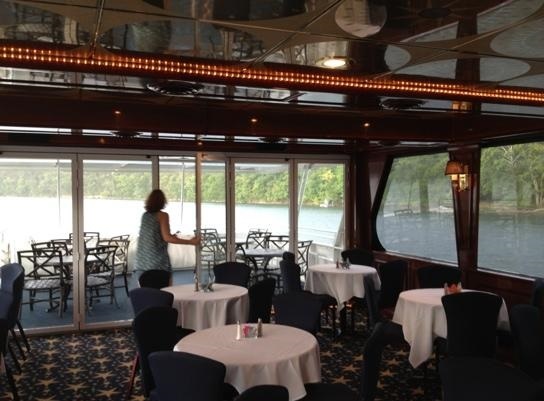 The Ozark Sightseeing Cruise with the Landing Princess offers Croissant Lunch that includes the same view as the Sightseeing Cruise but includes live entertainment and a deli-style lunch of sandwiches, chips, and drinks. With the Sunset Dinner Cruise, you can experience a great time in Branson by enjoying a spectacular sunset and a dinner buffet of ribs, roasted chicken, and plenty of sides. The Moonlight Cocktail Cruise is another brilliant way to see the sights of Lake Taneycomo under the brilliance of moonlight, cruising past Branson Landing’s Fountain Show and enjoy a great time in a cash bar to complete a memorable cruising on the lake. The regal Lake Queen offers another cruising experience to explore the sights and sounds of Lake Taneycomo. The Lake Queen is a replica of the paddle boats of yesterday that offers you a luxurious and comfortable cruising on the lake. The cruises on the Lake Queen provide you with plenty of interesting facts and stories of the sights as it rolls slowly across Lake Taneycomo. Each of the cruises also includes a great view of the performance of the spectacular Fountain Show at Branson Landing. The Lake Queen also offers a variety of cruises to choose from. The same with Landing Princess, the Lake Queen also offers Ozark Sightseeing Cruise, a wonderful way to explore Lake Taneycomo. With the beautiful ambiance of this paddle boat, you will feel like you’ve been transported back in time as you cruise past the famous sights of the area. For an extra special sightseeing experience with the Croissant Lunch Cruise, you can enjoy a sandwich lunch to your cruise experience on the lake. The whole family is sure to love sightseeing on Lake Taneycomo with the Paddle Wheel Pizza Cruise, where it’s great to enjoy a full pizza buffet while enjoying beautiful scenery around the lake. A guided commentary on the sites will be featured in this approximately 1.5 hour cruising experience. Lake Queen also offers Sunset Dinner Cruise which offers you a relaxing moment at the end of a busy day in Branson area with beautiful sights of Lake Taneycomo illuminated by the dazzling brilliance of sunset. A delicious barbecue buffet and light music can also be enjoyed in this cruise to create a truly memorable cruising experience on the lake. Another great cruising experience to enjoy with the Lake Queen is the one hour Moonlight Cocktail Cruise where you can enjoy a cash bar and the spectacular Fountain Show at Branson Landing. 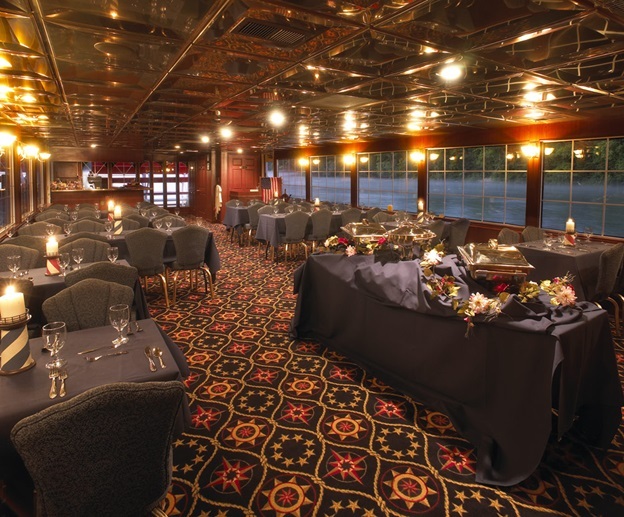 The Ozark Mountain Dinner Cruise offered by the Landing Princess features a delicious buffet with various Ozark treats like BBQ pulled pork that will give you a wonderful meal to enjoy along with the scenic views of Lake Taneycomo. The luxury yacht will help you explore the lake for the evening, to let you see panoramic lakeside views from three open decks or relax at one of the cash bars aboard the boat. The cruise lasts approximately 1.5 to 2 hours for an evening you will always remember. Father’s Day Dinner Cruise can also be enjoyed on the Landing Princess or the Lake Queen. This is the chance to give your dad something special for Father’s Day with a beautiful cruise out on the beautiful Lake Taneycomo. With this cruise, you enjoy complimentary champagne, barbecue baby back ribs, and a cash bar with seasonal specials. A Fireworks Cruise can be enjoyed on both Landing Princess and Lake Queen where the excitement begins as fireworks are lit off from Branson Landing’s Liberty Light-Up Fireworks Display, with all kinds of fireworks to light up the evening sky. A delicious meal can also be enjoyed in this cruise and snacks available for purchase aboard the ship. Thanksgiving Day Cruises can also be enjoyed in Lake Taneycomo. In this cruise, you can enjoy delicious “boat” cooked meal of roasted turkey, baked ham, mashed potatoes, sweet potatoes, mandarin orange salad, pumpkin and cheesecake. Beverages such as water and tea are also available aboard the Landing Princess or the Lake Queen. New Year’s Eve Party and Dance Cruise can also be enjoyed in the lake. There’s no end to the excitement on New Year’s Eve aboard the Landing Princess, with plenty of dancing and fun music by your favorite D.J. In addition, you can make a midnight toast to this special occasion after the countdown is over. Get the chance to watch the colorful fireworks that light up the lake not far from your yacht while feasting on mouthwatering hors’d oeuvres and a huge dessert bar. Party favors can also be enjoyed and a cash bar with drinks special is open throughout the evening. If you want to experience a thrilling water sports adventure or an exciting cruising experience on the lake with delicious dinner on board the Landing Princess or the Lake Queen, visit Lake Taneycomo in Branson.